Every woman who is pregnant or has just delivered, would have considered this at some time and made her choice. While many women choose formula milk for the convenience of it, if they were aware of the many benefits of breastfeeding, they would rethink their decision. Read through the following before making your choice. Breast milk is all a baby needs. Breastfeeding provides babies with the best start in life and is a key contributor to infant health. Exclusive breastfeeding is strongly recommended for the first 6 months. It gives infants all the nutrients they need for healthy development. The baby does not need water, other fluids, or foods during this time. After the first 6 months, breastfeeding continues to be important when other foods are given to the baby. A mother’s milk is especially suited for her own baby and changes from day to day, month to month, and feed to feed to meet the baby’s needs. At birth, babies do not have a fully developed immune system at birth. Breast milk is safe and contains antibodies that help protect infants from common childhood illnesses such as gastroenteritis, necrotizing enterocolitis, ear infections, urinary tract infections and respiratory infections. As a result of epidermal growth factor in breastmilk, the maturation of the intestinal lining is hastened which strengthens the barriers to antigens and the IgA protects gut from absorbing antigens. Many studies agree that breastfed babies have greater cognitive development and develop a higher IQ as they grow. There are anti-allergic benefits of breastmilk. Occasional formula supplements can trigger an allergic reaction, and should be avoided. 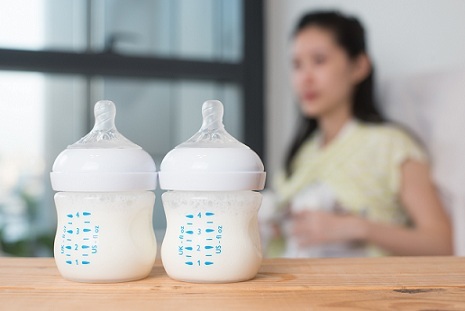 It has the greatest benefit if babies are exclusively breastfed for 6 months, it is continued for a minimum of 12 months, introduction of solids is delayed until 6 months and allergenic foods (milk, eggs, fish and nuts) are eliminated from the maternal diet. Sudden infant death syndrome (SIDS) is the unexplained death, usually during sleep, of a seemingly healthy baby less than a year old. This may seem like a very uncommon and rare disease but SIDS or cot death is the commoner than one thinks in infants between the ages of one month and one year. The cause is unknown but it has been linked to abnormalities in the portion of an infant’s brain that controls breathing and arousal from sleep. Breastfeeding has been proven to reduce the occurrence of SIDS. Breastfeeding is also beneficial to the mother’s health. Oxytocin release during breastfeeding contracts the uterus and helps reduce bleeding after delivery. It hastens involution of uterus (return to its pre-pregnancy size), faster return to pre-pregnant weight and there is a lower risk of postpartum infection and anaemia. Breastfeeding has also been associated with a reduced risk of maternal disease later in life including breast cancer, diabetes type 2, hypertension, cardiovascular disease, metabolic syndrome, ovarian cancer, osteoporosis, and rheumatoid arthritis. If you do not breastfeed you are a higher risk of developing anaemia, retaining the fat deposited during pregnancy, becoming pregnant soon after the baby’s birth, breast cancer and hip fractures in older age. It is also important to recognize that breastfeeding is much more than just a method of feeding, it is a relationship and a special bonding time for mothers and babies. The frequent and close physical contact between the mother and her baby builds attachment. However, this should not take away from father’s early relationship with their baby. They can and should build their own special bond with their baby. This can be done while giving the baby a bath, changing nappies or taking the baby for a walk while the mother is resting. It is important to also take the help of professionals such as your doctor and lactation counselor while pregnant to making this crucial decision for your baby. It is important to start within the first one hour after delivery to ensure success.